Experiment: Muscle Recruitment in your Jaw! Everybody chews. You will use the Muscle SpikerBox to record EMG's of the masseter and temporalis muscles, the two jaw closing muscles, while chewing different foods. You will learn about the relationship between the size of the command from the brain and the muscle force required to accomplish a task, and that even the simplest movements involve more than one muscle. You will measure the EMG amplitude of these muscles to see how the brain recruits and recruits motor neurons and muscle fibers to produce different amounts of force. Muscles are responsible for every single movement a human makes, the smallest things and biggest things- from running to blinking. The muscles in your face do many of the movements that make us human. Without them you couldn't speak, smile, frown, laugh, show surprise or sadness, kiss your loved one goodnight, or eat. You should recall what a motor unit is from the Record Electricity from your Muscles! and Muscle Fatigue experiments. (Refresher - it's a single alpha motor neuron and all the muscle fibers it innervates). In those experiments you looked at the biceps brachii and flexor digitorum, muscles with big, powerful motor units. The muscles in the face are much smaller, so they have smaller motor units (fewer muscle fibers innervated for each alpha motor neuron). The chewing muscles, however, have a combination of power and control to first break up tough food with larger forces but then chew it smoothly with finesse. Taking advantage of leverage attachment points on your skull, the jaw muscles can exert a very high and controlled amount of force. Recruiting different numbers of motor units and firing them faster or slower allows us to dynamically change the muscle force we require. The neural output of the brain is the main thing that determines the number of motor units recruited and their firing rates. A larger EMG (electromyography) signal indicates that more motor units are being recruited. As you will find out, you don't have to "think" about making that signal bigger to create more force in your muscle. Your brain automatically adjusts the neural output from the motor cortex to adjust to whatever movement you want to accomplish. 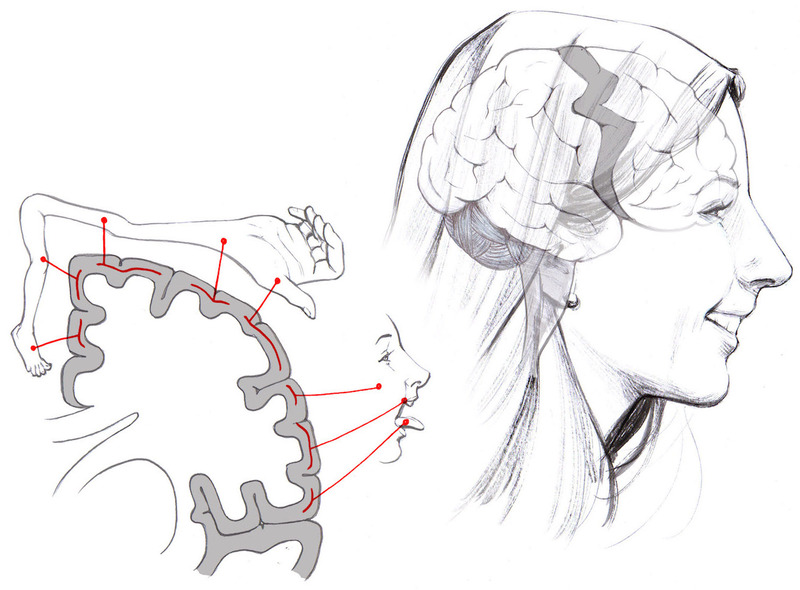 We'll use chewing to demonstrate the relationship between brain command, EMG level, and force output. Assuming you don't want to stick electrodes in your brain, we'll measure the activation level (number of action potentials generated by your muscle fibers) in the chewing muscles of your face as a reflection of the command from the brain. In this experiment we are going to learn about how our brain recruits the correct number of motor units and eat some yummy snacks. Before we start, let's make a hypothesis-a prediction about what we think we will observe in the experiment. For our hypothesis we are going to rank several foods from largest to smallest expected EMG signal. Make your hypothesis. Use the downloadable form above to write down the foods you think go in their progression from softest to hardest. Clench your teeth together as you feel the area of your face between your cheekbones and front of your ear for the muscle that sticks out while you are clenching. This is your masseter muscle. We are going to measure the electromyogram (EMG) of this muscle while chewing. As best as possible, use food materials of roughly the same size. Place the popsicle-stick electrode over the masseter muscle. Select the first food you want to test and place it between your back teeth on the same side as your electrodes. Press the record button in your SpikeRecorder software. Now chew! Try to chew normally and consistently, just enough to break apart the food. Observe (hear and see) the result of your brain using just enough motor units to chew the food you picked. 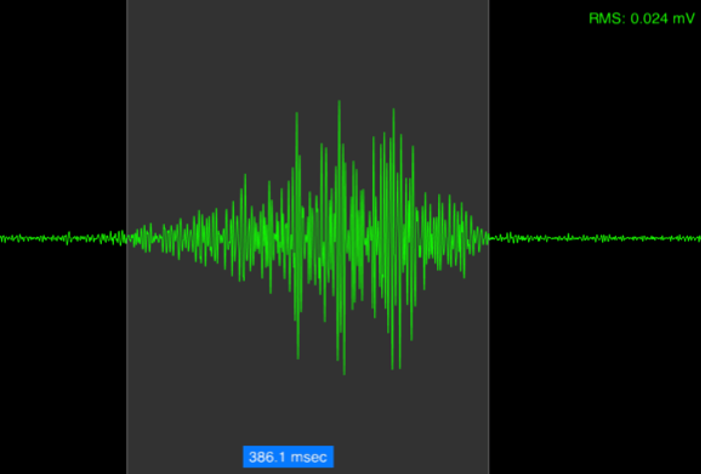 Stop the recording, and play the recordings back to measure the root mean square (RMS) of the middle part of each EMG "burst." Zoom in so that you can measure only the EMG signal without any noise. The RMS is a measure of the size of the signal. Use it to compare the force needed to chew different foods. Be consistent in your selection of the data for measurement. Check out the example below! This burst lasted 386.1 milliseconds and had an RMS of 0.024 millivolts. This was from chewing a gummy bear. How do your foods compare? Now repeat this process with the next food you want to test. Chew the foods in a random order selected by someone else. DO NOT move the electrodes between foods. Which food requires the greatest RMS value? How do your results compare with your hypothesis? Can you graph your results? What else can you discover? Look again at the muscle diagram above. Do you think there might be other muscles that help us chew? 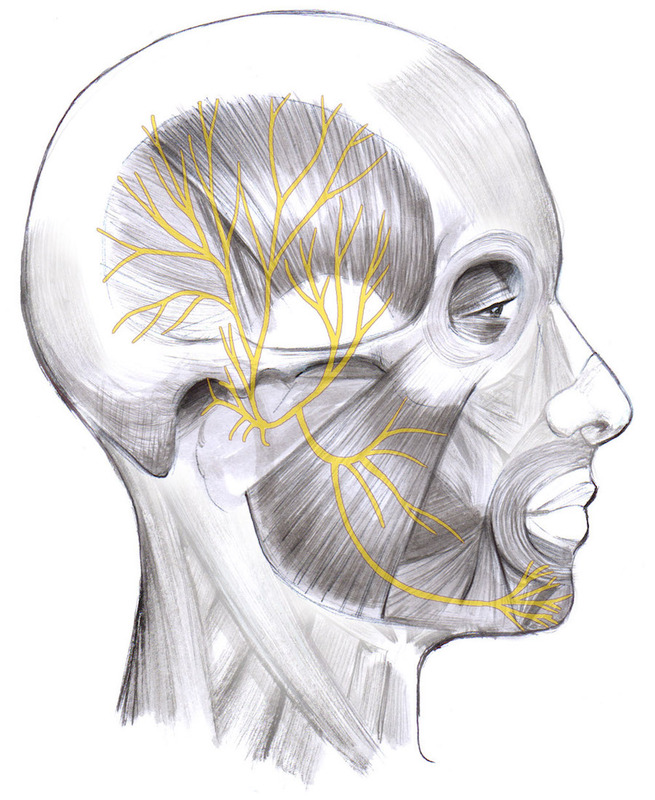 Feel the side of your temple for the other jaw-clencher, the temporalis muscle. You could repeat the experiment with that muscle. Muscles that do the same thing at a particular joint are called synergists. 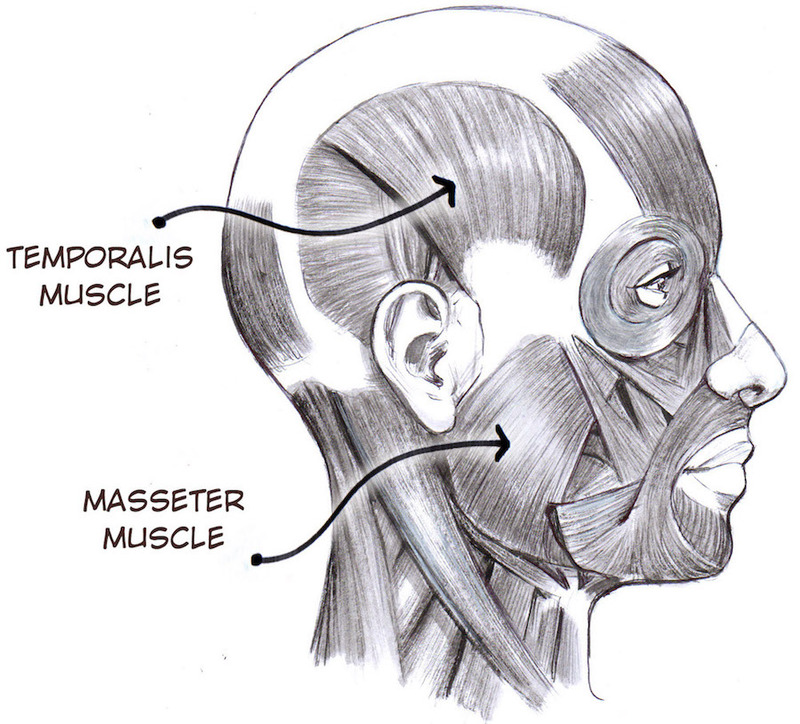 How do the temporalis signals compare to the signals from the masseter? Try recording from using different parts of your mouth to chew something. Does the electrical signal look different? Why do you think they do/don't look different? Does it depend on what you're chewing on in that part of your mouth? Does food normally use different parts of the mouth? We recorded from muscles responsible for clenching your jaw, but try to figure out and isolate which muscle is responsable for opening the jaw. Try the experiment again with foods that are "sticky" and make it harder to open your mouth to chew again. Hint, the muscle is called the Lateral pterygoid. When muscles "spike", they contract-so opening and closing your mouth must use different muscles. Try recording both the masseter and temporalis muscles at the same time with our Muscle SpikerBox Pro.